Never before has a nebulizer become a symbol of love. But a nebulizer in Jill Shalvis’s hands will move you more than dozens of roses and chocolate ever could. 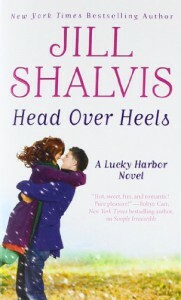 Head Over Heels takes place in Lucky Harbor, a town that seems to be crawling with handsome single men. Just when you start to think they are all being married off in walks another bachelor. One of them is Sawyer, the straight-laced sheriff. The whole handsome good guy thing is enough to make you drool. Then you get a glimpse of the guy he used to be and you might break out in a sweat. Chloe and Sawyer appear to be like oil and water. She is bubbly, fun, mischievous, and frail. He is stoic, strong, and controlled. And in the beginning they really are a little like oil and water, they frustrate each other, piss each other off, avoid one another, and would bet money on them never becoming a couple. Then something happens and you don’t even see it happen. Shalvis simply lets them grow on each other and before you know they are craving each other, being concerned over the others welfare, and finding that the idea of being a pair isn’t quite so bad. Head Over Heels is a great contemporary romance that is simply fun to read. Great dialogue that will make you laugh and smile. Memorable characters that make you feel part of this small town. Even if you don’t usually enjoy contemporary romances you will like this one.